Create the appearance you’ve always wanted thanks to our dental care team. Dentures are one of the easiest and most aesthetically pleasing ways to restore your smile to its fullest beauty. If you’ve lost your natural teeth because of decay, gum disease, or even injury, dentures may be a reasonable solution that can improve both your health and your appearance. At New Smile Dentures And Implants, we’re here to find the best fit for you. Get in touch with us today and we’ll provide you with further details and costs for our dental services in Denver. At New Smile, our cosmetic dentist will set you up with a customized set of dentures to fit your needs. Whether it’s a duplicate of your natural smile or one with cosmetic upgrades, the choice is yours. Patient satisfaction is always our No. 1 priority. Keep reading to learn more about dentures. Many patients don’t realize that losing teeth actually causes their facial muscles to relax and sag, leading to an aged appearance. Because dentures fill out your face, your expression appears more lifted and youthful. Dentures need to be cared for in the same way as teeth in order to remove food particles and plaque. Of course, regular care can also prevent staining. At New Smile in Denver, we would be happy to walk you through our denture care routine and set you up for success with your dentures for years to come. We look forward to helping you fall in love with your smile once again! You are in good hands with Dr. Steele and the rest of our dental care staff. 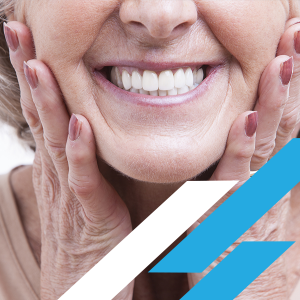 Reach out to New Smile today and see if dentures might be a long-term solution for you.